...... 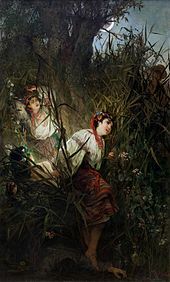 In Slavic folklore, from Russia through Ukraine, Belorusia, Poland, the Balkans to Slovakia and Czech, one finds this water nymph - sprite, mermaid, water creature usually inhabiting a lake or river, but also associated with the sea - this is a RUSALKA. And then there is the wonderful, and rightly famous, aria, "Song to the moon" from the opera Rusalka by Czech composer Antonin Dvořák. There are many great recordings, from the early divas Fredericka Von Stade and Lucia Popp to today's greats Anna Netrebko and Renee Fleming. It should be mentioned, there is another lesser known opera called Rusalka written by Russian composer Alexander Dargomyzhsky, taken from an incomplete poem by Pushkin.